Home » News » Do you want Android or Windows on your Archos? Do you want Android or Windows on your Archos? The French brand ARCHOS is excited to release two 5” smartphones both featuring great specs and an even better price: £99 each! The ARCHOS 50 Cesium runs Windows 10 right out of the box, and the ARCHOS 50e Helium runs Android 5.1 Lollipop; with a choice of operating system, these models can suit any need. “By providing a choice between two almost identical hardware models, we allow the customer to focus on what they like on the inside: the user interface. Android and Windows are both fantastic and provide varied software experiences,” says Loic Poirier, CEO of ARCHOS. The ARCHOS 50 Cesium and 50e Helium smartphones are nearly identically fantastic in terms of hardware specifications. They both feature 5” HD IPS screens for top-notch viewing quality. The display renders bright, realistic colors and allows wide viewing angles. The processing and storage of the ARCHOS 50 Cesium and ARCHOS 50e Helium support many varied uses ranging from light messaging and phone calls to CPU-heavy gaming applications. Both feature Qualcomm Quad-Core processors which run at 1.1 GHz. Both devices feature 4G/LTE connectivity for the fastest possible download speeds and lightning-fast internet, email, and messaging. This internal power is complemented by a sleek outer design with rounded edges and a metal frame. As the ARCHOS 50 Cesium runs Windows 10, and the ARCHOS 50e Helium runs Android 5.1 Lollipop, customers can choose the operating system they love the most without needing to worry about other technical nuances that differentiate smartphones. Since ARCHOS is offering a great base product, having only to choose between two operating systems is liberating and simple. Windows 10 is the latest Windows release and features Cortana, the Windows personal assistant, Microsoft Office apps, a more intuitive email inbox, and more. Android 5.1 Lollipop is the latest version of the famed Android software and offers better battery management, a dynamic notification system, and an aesthetically pleasing flat design. 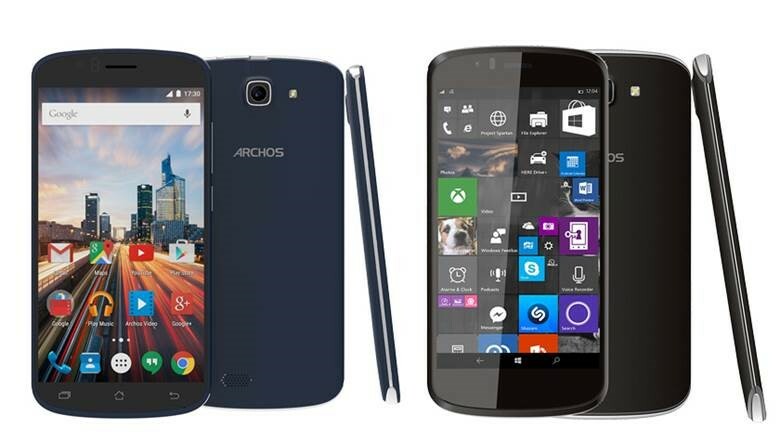 The ARCHOS 50 Cesium and ARCHOS 50e Helium will be available in November 2015 for the incredible price of £99.